It would take months to explore Rainbow Basin and the area around Owl Canyon Campground. But you’d have a great time! Around eight o’clock this morning the crew and I prepare for a hike. I fill up a canteen with water and hook it onto a belt loop. I don’t have one of those collapsible-dish-on-a-water-bottle thingy, meant for dogs. Instead, I put a heavy duty freezer bag in my pocket. This I can open up, fill halfway with water, and scrunch down the sides to make a bowl. I put Bridget and Spike in their harnesses, hang my camera around my neck, don my hat, and adjust my walking stick to a comfortable length. Off we go! It’s a two-mile trail. I can see after about three-quarters of a mile, the crew is losing power. I set up the water “dish” for Bridget and Spike. They act like it’s a trap, refusing to drink out of it. Instead, three orange butterflies appear out of nowhere, take a sip, and flutter on up the trail. There are pink, coral, green, several shades of purple, aqua, blue, white with black specks, black with white specks, striped rocks, well, you get the idea. Lots of interesting rocks. Of course, if you take one, they cut off your hand. The walking stick is invaluable. At several places, crossing gullies or going up and down steep banks, I easily could’ve twisted an ankle if it weren’t for the walking stick. At about a mile I turn us around for home. We don’t get home until about eleven o’clock. (We walk very slowly and look at stuff.) I cook up a hearty lunch for us. For me I cook chicken sausage. For the crew I cook a chicken hot dog for them to share. After lunch, I take a bath and wash my hair. Bridget and Spike fall asleep in their pen. I have to smile at their motionless bodies. The hike really knocked them out. The weather is perfect. Blue sky, warm breeze. I doze off in my lounge chair. I love living in this desert stillness. The campground has been empty since Francois and Joan left yesterday. It’s like I’m renting an entire campground for $3 a night. I live in an enormous outdoor house and all these shelters are my various outdoor rooms. I have several toilets from which to choose, three playgrounds, and many tables at which to dine! 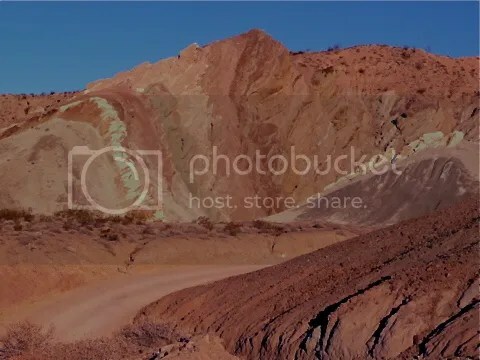 The slideshow is a collection of photos taken in Rainbow Basin, around the campground, and on hikes in the area. You can see how the time of day changes the color of the rocks. No sign of Buddy, the pit bull, today. Next time I see Ranger Jim, I’ll inquire about Buddy. 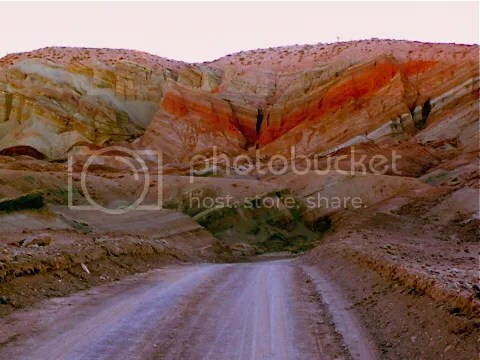 This entry was posted in Simple living and tagged California, casita, desert, geology, hiking, Owl Canyon, Rainbow Basin, trails, walking stick. Bookmark the permalink. Love, love, love that canyon. Happy you’re getting to enjoy the campground to yourself. When we were there last year we were the only rig too….definitely makes it a special experience. Yes, it does! Now I know why rich people reserve an entire resort… ha! You should have seen the look Bridget gave me! LOL! I bet it was priceless.. BTW,, I looked up Shortie Rossi on wikipedia. He is in LA, and has a TV show where he rescues Pit Bulls.. I’ll see if I can get in touch with him in the morning..I’m in New York too late to do anything now..
That would be great, Dominick! I’m typing this in the morning… and you are not going to believe the latest development in the Buddy story. He still needs a home. I’ll write a blog entry and share the details. It would be a miracle if anyone rescues this dog, given our location, but I appreciate anything you can do for him. Thank you, LuAnn! Come back! Beautiful, beautiful, beautiful… so glad you are mapping out lots of places to visit. Life is uncertain grab the beauty in everyday!! P.S (the sprain ankle turned out to be a broken ankle and I won’t know till Friday what they want me to do…. I have a HATE HATE relationship with these crutches. GUARD your ankles ! Are you the person who told me they were on crutches ages ago? How terrible! I’m so sorry you are still having to cope with this. You give us all a good reminder to be careful. One wrong move and you’re crutching around . . . I hope you get some good news. Nope, First time on crutches (and hopefully the last) I am not a very good patient! What a delight. A whole campground to yourself and surrounded by colorful rock. Sounds like heaven. I’ll bet those two were plenty thirsty upon your return. Yeah, they were thirsty on the trail, but they wouldn’t go near my makeshift water bowl. You would love it here, Gaelyn. Great slideshow! It’s getting cooler at nite (35ish) but warm days (lo80s) but the shorter days,the sun goes below the mtn ridge…instant cool-cold! Official, our replacements arrive Dec1, then we’ll book City of Rocks for a week and Geri will get her crown(tatataDA) and her bridge at Dr Gordons and have timr to explore and try Faywood Hot Springs(just reopening and reports are very good for springs and camping. Radar seems much better. Keep them pitchers’ coming please!!!! Hot springs will be the perfect reward for Geri getting all that dental work done. I know she loves to soak. She and Spike have that in common! Only Spike will soak in frigid water . . . So happy to hear Radar is doing much better. Are they really strict about taking rocks? In Australia, they don’t want people to take rocks from Uluru (Ayers Rock) because it is a sacred native area. So, I wondered about your comment. Beautiful area! If you take something out of a national park or monument, you’re in big trouble. You’d probably get a huge fine. I saw a sign around here somewhere cautioning people from removing any natural items. I don’t know how that rule can be enforced here. I could easily take off with a load of colored rocks. Perhaps Buddy is lost not abandoned. Remember Rusty and Timber? I’m not in a big hurry to locate an owner. I’m from Georgia (think Vick). Pit bulls aren’t always beloved pets. I’ll bet Spike is wondering “where the heck is the water for me to lay in ” ? It’s a mystery what goes on in his little brain . . . unless, of course, he tells us in the Canine Corner. LOL! Sue, I’ve been reading your Blog since September. I have never commented to any of your posts but tonight I thought i should thank you. You bring a smile to my face when my phone lets me know i have an e-mail with your blog post. I feel as if i’m traveling right along with you to places I would love to see. Although I can still travel I will never be able to do it to the extent you do. I’m from Arizona and you have made me appriciate the beauty of the desert again which I seemed to have lost over the years as I just concentrate on the day to day living. As you traveled through the Northwest you brought back the memories of a childhood where i tromped through the thick green forests of Washington state. So thank you for sharing your life with those of us that are still living the daily grind. Travel safe! Welcome, Linda! I’m so glad you’re with us! Thank you for the lovely comment. It does my heart good to know my blog brings back happy childhood memories. You have a wonderful day . . .
Hi Marcia GB! I want to get one of those bowls. Of course, I’ll have to train my suspicious crew to drink out of it before we take it on a hike. What a pair. After all I do for them . . .
You are indeed a wealthy woman RV Sue! So are we Rob and Me…because Sue n crew so generously share all with us! Thanks Sue, you always manage to put a smile on my face. You’re welcome, Sharpei. How can I possibly be a grumpy in the morning when I wake up to comments such as yours! Yes, I am, Rob. And what’s great is I get to share my wealth and the more I share, the more I have! Hello, suburbanlife! If this is your first time commenting, welcome to my blog! Bridget and Spike soon caught on… Every time we came upon some shade, they plopped down, which actually was a good way to hike. It’s amazing what a few minutes rest in the shade will do for your energy when hiking in the desert. Sue do you cook inside your Casita and if you do have you seen any detrimental effects? I almost always cook inside the BLT. The only detrimental effect is the range top gets dirty and i have to clean it. We are planning a trip in april/may with a rental motorhome and i wonder if we can get out there with a 34 ft A-Class. You could get here with a 34 ft. motorhome. I warn you, though, there’s a lot of washboard road to get here. You have to go very slowly and be patient. enjoy your blog every time you post. We have a sad situation here in Jacksonville, Florida. A veteran suffering from PTSD had his beloved Australian Blue Heeler stolen. He is offering a $1,000. reward for its return. I saw the signs here and googled it to find out the information on it. Hope someone can help him. What a life! You’ve got it all figured out & as a bonus, you are the only blogger that can make me laugh so hard I spray coffee all over my keyboard. Love your writing and adventures, keep them coming. Dear RVSue, your pictures are just beautiful especially the one with the rust color so prominent in the center. Lovely. Thanks so much for sharing such a fabulous camping spot. Dear Spike and Bridgett, I so enjoy the pictures Sue posts of you two. And I can tell you apart by your ears. Why are they different? Brigett’s at attention grabbing all the sound and Spike’s flopped over in the relaxed position? Maybe you could tell me in the corner some time? 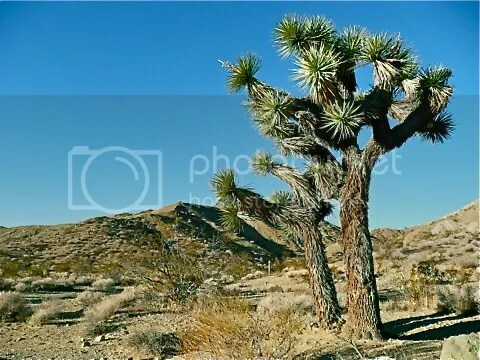 Seems like a neat place considering your are in a very desert desert for sure (but not been that far up, my wife’s folks lived in Victorville for some years back in the ’90s. Enjoyed seeing what it looks like up that way. I believe Louis L’Amour did some wandering in that area & wrote about it later on. This would make a neat painting titled, “A Road Less Traveled”. If you have an objection to me playing with your photos, let me know & I will delete them. I didn’t see your comment right away, DesertHawk. I don’t mind you playing with my photos. If you sell them for tons of money (like that’s gonna’ happen), give me a commission! 10-4 on the Commission, but don’t hold your breath, I’ve never sold a photo in my life….so far…Ha!